The Latin American and Caribbean Network for Democracy (REDLAD) denounces the systematic assassinations of leaders and leaders who have been registering since last year in Colombia. Likewise, it condemns and expresses its deep rejection of the threats that members of the National Victims' Bureau belonging to Social Organizations and of the Corporación Viva la Ciudadanía de Colombia, as well as several leaders and social leaders of the Colombian regions, have received from the Last June because of its defense of the peace process and the demand for the construction of a Social and Democratic State of Law. On July 13, the Colombian Ombudsman's Office informed the country that according to its investigations there are 52 leaders murdered in 2017, and if the 2016 cases are added, as the UN has denounced, the figure reaches almost 180. Especially in Areas where the FARC previously operated and which are also part of territories of different indigenous peoples and Afro-descendant communities, some of which today are under constant threat from other groups outside the law that have occupied the places of power of the FARC. Demobilized guerrilla. On the other hand, "on 22 June 2017, through an e-mail, the National Bureau of Victims belonging to Social Organizations, several of its leading organizations and leaders and the Corporación Viva la Ciudadanía, we received a threat from the Group called the Capital Block of the Black Eagles, as it has been several times in the past; And on Sunday, July 23, some of us received text messages on cell phones with accurate personal references that endanger our integrity and that of our families, "said the statement issued by Corporación Viva la Ciudadanía on July 26 . In connection with the above, the Peace and Reconciliation Foundation has authorized a tool (see here) that allows establishing the number of selective violence cases that have been presented in the different territories of Colombia, from the year 2013 to date. We demand that the Government of Colombia take all necessary measures to protect the integrity and life of the people who have been the object of threats, which the Corporación Viva la Ciudadanía and other social organizations have denounced. We request the competent authorities of Colombia to undertake the pertinent investigations to find those responsible for these threats and the murders, and to bring them to justice. We urge international organizations and the Inter-American Human Rights System to pay special attention to this serious humanitarian situation. We demand the Government of Colombia and other competent authorities to protect and respect the territories of indigenous peoples, Afro-descendants and other rural communities that are being affected by this situation, in coordination with their traditional authorities and organizations. We invite civil society organizations, activists and political and social leaders of the continent to stand in solidarity with the people and organizations threatened. It is the duty of everyone to protect the integrity of these people and to defend the peace process in Colombia that has saved thousands of lives. 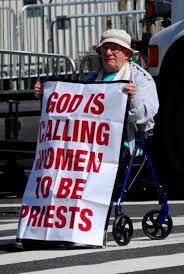 holding a sign calling for women priests. 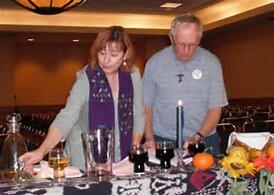 around the globe to walk in his footsteps and and support women priests. St. Jerry Zawada, may you inspire courageous action for peace and justice. for more than 300 people. 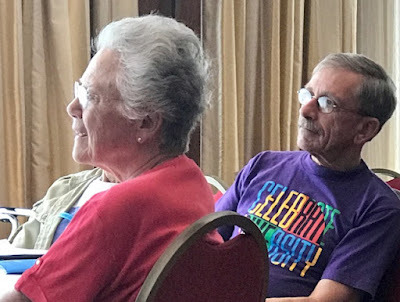 a close friend and fellow activist, in 2010.
he said he has given consideration to for "quite a long time,"
adding that the structure of the church "needs reshaping." Fr. John Puodziunas said he hadn't done in recent years. "do not worry. Explain whatever you have to explain, but move forward." Even as age weakened his body, his spirit to continue his vocation remained strong. calling for that," he told NCR in March 2014.
the border to assist immigrants. protests against nuclear weapons, drones and wars and conflicts. 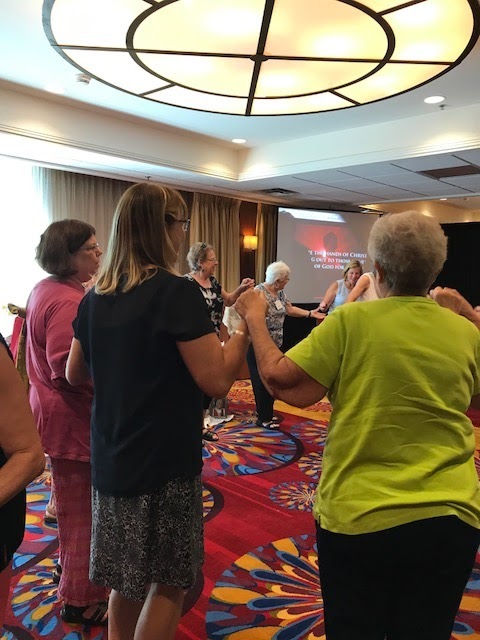 exemplify Franciscan values of living simply and sharing resources," said Kathy Kelly, a Chicago peace activist and co-coordinator of Voices for Creative Nonviolence. numerous military bases and facilities across the country. incapable of offense, a priest who most identified with the down and dejected. Zawada was a friend to all. "a prophet for peace and justice." "He always would say he believed what he did was God's will. And that was his faith, that he was following God's will," Gannon said. [Brian Roewe is an NCR staff writer. His email address is broewe@ncronline.org. resources are from Ilia Delio and Greg Boyle. Ilia Delio, in a YouTube lecture, presents her reflection on what it means to live the Gospel in an age that is global, plural and scientific. 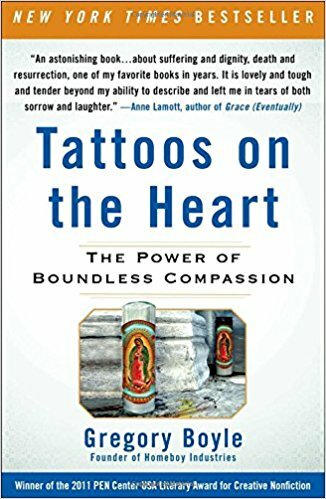 Greg Boyle presents what his baptismal call and confirmation commitment look like in his work with gang members from LA. The course is divided into 6 sessions over 12 weeks. Each session is two weeks in length. During the first week, listen to or read the resources. In the second week write a reflection based on the questions in each assignment. We encourage you to read and respond to each other's inspired words. Please begin each reflection with Session number: Your name. If you have any questions, please send them to Mary Theresa at mtstreck@gmail.com. Many blessings as you begin this journey together. ..."In reading the Gospels, it doesn’t take long to start realizing that Jesus was no friend of the religiously and politically powerful. As a matter of fact, in one of the most surprising stories about Jesus (and I would argue the story that most influenced his being given a death sentence), he strikes at one of the most essential tools of the powerful – money. When Jesus starts flipping the moneychanger’s tables in the Temple courtyard, he is striking at a very important source of power for the Sadducees and Pharisees. Not only does he strike at one of their sources of power, Jesus goes a step further and denounces the religious elite for turning God’s temple into a “den of thieves” (Mark 11:17) – because that’s what it had become. Those who were already wealthy were taking advantage of those who had little – some would even be considered “the least of these.” (That may sound oddly familiar to those who follow U.S. politics). In the courtyard, moneychangers exchanged Roman money for Jewish currency. Folks needed to do this because Jewish currency was the only currency accepted in the Temple and on the Temple grounds. They needed the Jewish currency to buy animals which had been approved for sacrifice. It probably won’t surprise you to find out that the Sadducees and Pharisees profited outrageously in exchanging Roman money for Jewish currency. It probably also won’t surprise you to learn that the religious leaders also made quite a profit on the sale of the approved animals. Now, the story gets even more politically interesting when you consider the Temple’s architecture. The temple courtyard was surrounded by a tall wall. During Passover, which was the time of Jesus’ table flipping, those walls would be lined with Roman guards, who were insuring nothing got out of hand during a festival that celebrated the Jewish people escaping an ancient oppressive ruler: the Egyptian Pharaoh. The thought process probably went a little like this: If you are the occupying Roman government, the last thing you want is the story of the Jewish nation escaping an oppressive ruler to give the commoners any ideas. So, you make your military presence felt. So, in this story, we have Jesus walking into the watchful eye of the Roman guards, into the seat and source of power for the local ruling Sadducees and Pharisees, and then he loses it. He confronts the corrupt system that misuses its power and oppresses those in need. He literally and figuratively begins flipping tables on the powerful. He makes a political statement calling them a “den of thieves.” And he does it all under the watchful eye of armed militants. It is laughable to say that Jesus wasn’t political. Jesus confronted the very political structures and people who were twisting and using religion to step on those thought of as “the least of these.” He confronted the politically powerful Sadducees and Pharisees at every turn, calling out their hypocrisy and distorted use of the Hebraic Law. And, he then taught what the Law was really meant for: the expressing of Heaven on earth; a place where grace, love and justice were practiced. So yes, I’m political. I’m not a Republican or a Democrat. I’m an independent. And, in general, I don’t support particular politicians. I’m more about supporting laws and government programs that help those most in need and about resisting laws and government programs that hurt people. Theologically, I simply can’t see how to follow the teachings of Jesus without being political, being willing to stick out your own neck, and being willing to challenging the hypocritical power structures and leaders on behalf of the oppressed. So, for theological reasons, I’m political." "It is ironic that you must go to the edge to find the center. But that is what the prophets, hermits, and mystics invariably know. Only there were they able to live at the edges of their own lives too, not grasping at the superficial or protecting the surfaces of things, but falling into the core and center of their own souls and their own experiences." Richard Rohr, Eager to Love, p. 11. "Most of organized religion, without meaning to, has actually discouraged us from taking the mystical path by telling us almost exclusively to trust outer authority, Scripture, tradition, or various kinds of experts (what I call the “containers”)—instead of telling us the value and importance of inner experience itself (which is the “content”)." Our ritual began with a reading from the Gospel of Luke (12:49-53) and was followed by each person tying a knot in a scarf as they named a person with whom they felt separated due to a conflict. 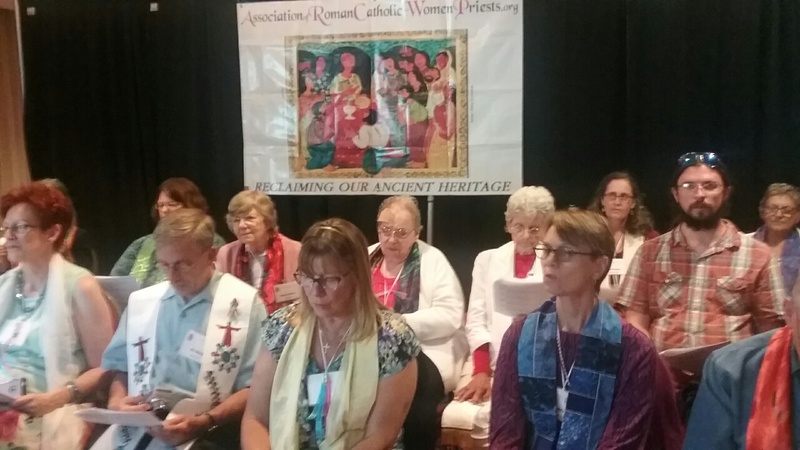 We ended by praying a Prayer of Reconciliation and Peace that was written by Michele Birch-Conery, Bishop, ARCWP. 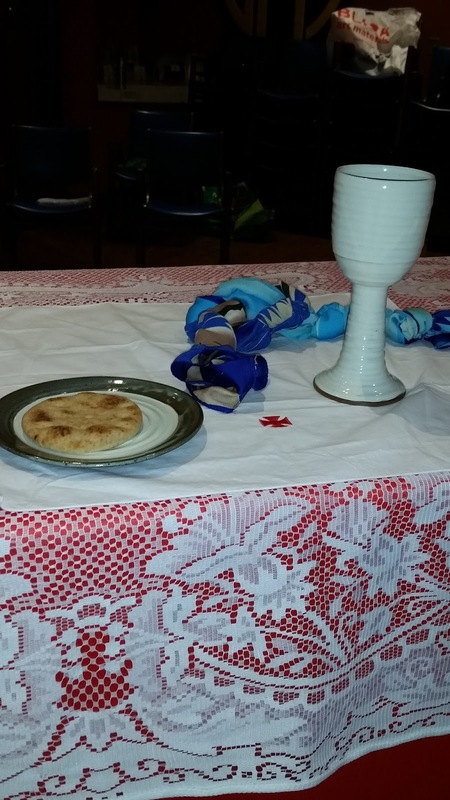 We laid the scarf on the table of worship during the Eucharistic Prayers. Celebrant 1: Creator God, Holy Mother Wisdom, in the life of Your Cosmos You determined that light should rise from darkness, and the stars and the sun came to be. Celebrant 2: We live in night and we live in day. As in the outer world, so it is in our inner selves. Co-Celebrant 1: We are awake and we sleep in the rhythms of the hours, and we know joys and sorrows. 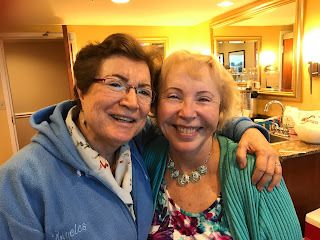 Co-Celebrant 2: There is never one without the other in the span of a lifetime because of the ultimate freedom You have given for all persons and all creation. Co-Celebrant 3: In everyone, in everything, the dark and the light flourish. Co-Celebrant 4: We ask You that we not perish in the darkness of too much dark or in the light of too much light, but that all be held in balance for the good of all. Co-Celebrant 5: We take a few moments of silence to reflect upon when we have chosen Your way of balance and when we have not. Co-Celebrant 6: Pour forth Your Spirit upon us that we may always witness You in light and in dark. Co-Celebrant 7: Let light always overcome the blinding dark of violence and war. Celebrant 1: Let us rise again with You in the peace of your merciful and compassionate heart. "The Catholic Worker community has four houses in Des Moines that focus on a nonviolent lifestyle while serving the poor. Some members of the community have been critical of the Des Moines Roman Catholic Diocese and have called for changes that include ordination of women as Catholic priests and stances against corporate agriculture and the military-industrial complete"
"...We often hear it said of Pope Francis: “He’s not a great theologian, but he is a great pastor,” as if this assertion made any sense. As a theologian who shares Pope Francis’s heritage of Latin American Catholicism, I strongly disagree. Pope Francis is a terrific theologian, whose theology is coherent and cogent because it arises precisely out of his walking with the community. And he is a great pastor because his pastoral practice and teaching are informed by a careful and thoughtful theology that reaches back into our tradition and grounds itself in the Gospel. Without the tools of serious inquiry, of analyzing structures, of recovering millennial wisdom and of searching jointly for solutions, our pastoral practices become escapes into an “other-worldly” Christianity, which goes very much against Jesus’ own practices and those of the early church. Likewise, if we have all the intellectual tools in the world but we lack the most basic love of neighbor and concern for God’s creation, those tools are worthless." 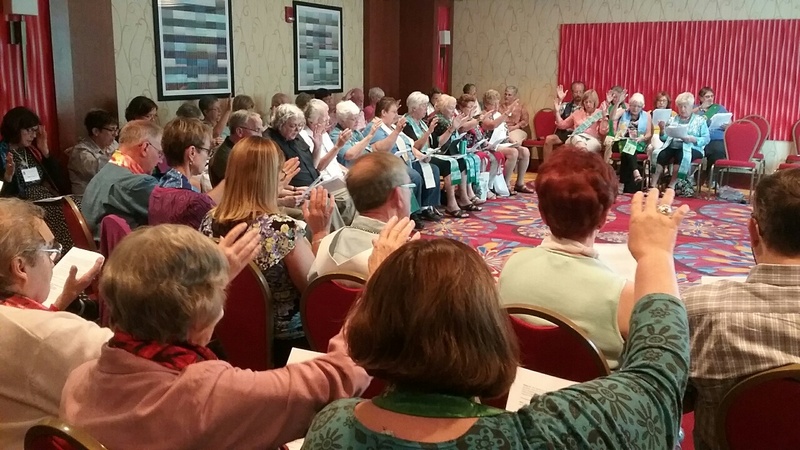 Getting Ready for Ireland: Why Women Priests in Ireland Now? This is a busy week as we start final preparations for our journey to Ireland on July 31st. Our upcoming schedule in Ireland. Mary Theresa Streck , Joan Chesterfield and I are looking forward to traveling around the Emerald Isle sharing the good news about the Association of Roman Catholic Women Priests (ARCWP). We look forward to many cups of tea and lively conversations along the way with women called to ordination and their supporters. You might wonder,why bother to promote a movement that is rejected by the Vatican? Why not be ordained in a more welcoming church? I was born in Ireland and Catholicism is in my DNA. Our family came from Rathdowney , County Laois. My mother, Bridie raised us in a home in which the Sacred Heart, the Blessed Mother , the angels and saints felt like extended family members! Not only did we have holy pictures on the walls, the holy, heavenly ones were called upon on a daily basis. Every night we prayed the family rosary around the hearth. My mother blessed us and sprinkled holy water on us everyday in our coming and going. My Dad Jack, was a gifted musician, who played trumpet, sax and trombone in our home and in a band that travelled around the midlands. His family came from Ballyroan and there were known as the musical Meehans! His father, John, and brothers Jimmy, Paddy and Dad were all proud members of the Ballyroan Brass Band. I still remember the first song that I heard Dad play on trumpet in our cottage : "O My Papa. Our movement is a justice movement to bring equality to our church now. 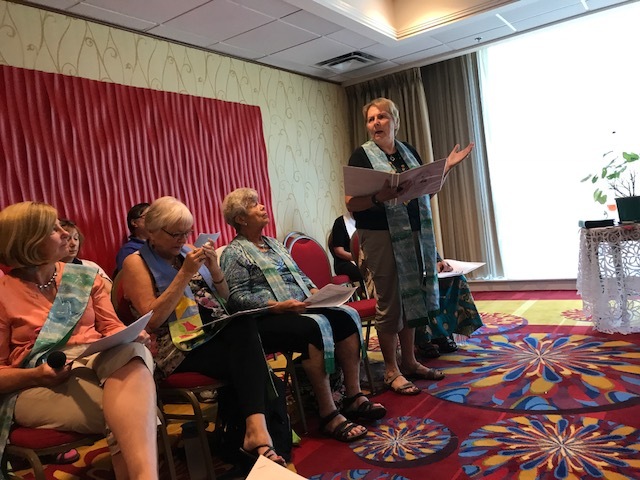 We are living our call to heal sexism and renew the church in the mystical, prophetic and sacramental tradition in inclusive communities where all are welcome. There are over 250 in our worldwide women priests movement. We are ordinary women living extraordinary lives!